“What we're saying is genocide comes from dehumanization. When people are killed from abortion, they're killed because their humanity is taken away." Genocide: “the deliberate killing of a large group of people, especially those of a particular ethnic group or nation.” Neither Oxford, nor Collins nor Merriam-Webster’s dictionary mention anything about dehumanization in the official definition of genocide. Now, I understand where this thought is coming from. In Nazi Germany, Jewish citizens were not treated with dignity or respect, and were therefore dehumanized. But using words with such a strong meaning can backfire. Say exactly what you mean or people will inevitably infer otherwise. Genocide is heavily connoted with the Holocaust. 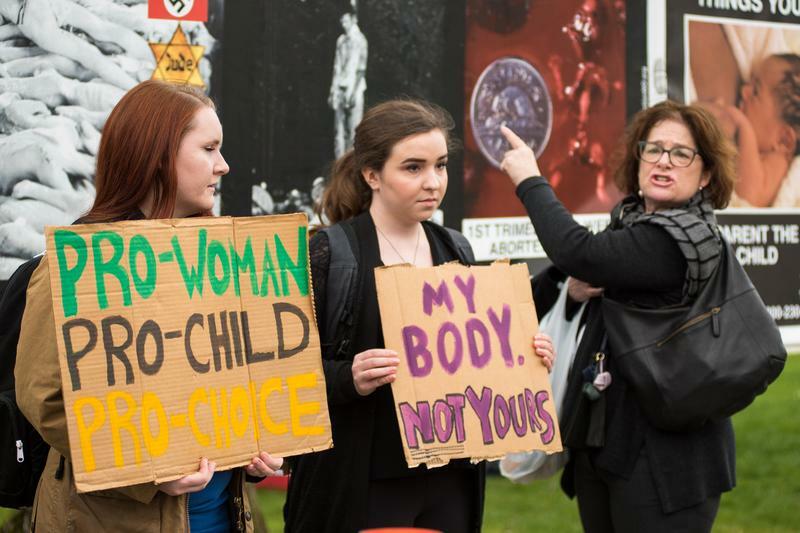 When you throw an anti-abortion protest and display a sign that reads “genocide” in large block letters, people are going to assume you’re making a connection between Hitler and someone who cannot or does not want to give birth. Throwing this word around for the shock value is going to bring about real consequences; you can’t put these signs out and expect to be protected from any backlash. What’s even more troubling to me are the images used alongside the term “genocide.” “Unwanted” children cannot legally be aborted after a certain point in a pregnancy. The Abortion Rights Coalition of Canada shows that less than 0.5 per cent of abortions are performed after 20 weeks through a pregnancy and this is only when the fetus is impaired or the life/physical health of the pregnant person is at risk. When you mention genocide beside the picture of an aborted fetus at 24 weeks, you’re pretty much saying that someone who had a miscarriage is a murderer. The images that are being displayed are propaganda. They’re being misused to shame people who have to make this difficult choice. They’re incredibly offensive towards people who have lost a baby due to circumstances beyond their control, not to mention triggering for people who actually have history or experience with acts of genocide. It is specifically mentioned under “Hate Propaganda” — easily accessed on the Parliament of Canada web page — that genocide is “defined to mean killing members of an identifiable group or … [intending] to bring about the group’s physical destruction.” Anybody who advocates genocide can face up to five years in prison. After taking this into consideration, the comparison between abortion and genocide is ridiculously unfounded. The decision to abort a fetus is not made to bring about the destruction of all babies. Not to mention, the Criminal Code defines an identifiable group as a “section of the public distinguished by colour, race, religion, ethnic origin or sexual orientation.” Yet there is no identifiable group against which abortions are attacking. We simply don’t agree on the facts. I’m not saying you’re wrong for believing that abortion is murder. However, I personally don’t consider a fetus to be a person. What I am saying, though, is that abortion is in no way, shape or form comparable to genocide in the slightest. If you don’t believe in abortions, don’t get one. If you think they’re dehumanizing, write that on your signs. Perhaps the day will come when abortion is no longer needed. The day when people are able to take maternal/paternal leave from work without sacrificing their careers. The day when there are sufficient government resources to truly help families in need as well as fund foster care. The day when we are able to prevent the otherwise inevitable death of a pregnant person without aborting the fetus that is causing the damage. But even if that day comes, it’s still not your right to make that choice for someone else. Sandeep Middar is a student at UBC-Vancouver.